Loving all the old memories but must say I think we should try to make the link between yesteryear and today by filling in the gaps a little closer to this way. E.G memories of mine is watching Frank Bruno beat Oliver Mccall in 1994 (I think) to finally win the world heavyweight title at the 4th attempt. The club was packed and the place was rocking, fantastic. Also the Winnings when it was owned by Mr Larry Thompson evokes many fond memories, snooker tournaments to keep the youth occupied and an improvised boxing gym in which myself and the Sacriston boxers, (Mcleans) used to train in prior to fighting. The people in the snooker hall used to complain as the balls would move when we were belting the bag downstairs ! 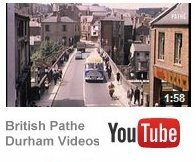 Ushaw Moor when I was a lad was a thriving village. There was no television in those days and there was a strong sense of community in the village. There were a number of focal points in peoples lives which are sadly missing today, but time moves on. The churches and chapels in the village were very active, most children went to church or chapel and their principals of right and wrong were honed on a Sunday, the sense of right and wrong was instilled in most children at a very early age by their parents. There were two pubs and two clubs, the Flass and the Station Hotel, now sadly demolished, a beautiful building internally and externally. Then there was the “Bush” at the bottom of Station Road and the Big Club now also sadly demolished. There were three Stores, Crook Store on the crossroads opposite the Flass, New Brancepeth Co-op Society in Durham Road which Tom Mc Cormick turned into a thriving business and Broughs right at the bottom of Station Road. Then there were numerous shops where you could by most things for the home, butchers, bakers, fish shops, chemist, off licence, greengrocers and drapery shops. There was no need to shop anywhere but the village and this instilled a strong sense of belonging. There were four fish shops in the village. Babsy Thompson whose shop was just above the Salvation Army Citadel, Lukes fish shop half way up Station Road, Mrs Hoppers in the end house in High View and Mrs Barkers shop in Temperance Terrace. Mr Jack Russell was the postmaster at The Post Office which is still in situ in Temperance Terrace, he was assisted by his daughter and one of the Mc Pherson girls who lived in Whitehouse Lane. Mr Russell had a large garden directly across the road from the Post Office. Stan Watsons shop window in Durham Road was magnet for us kids. The window was very large and deep and it was full of things of interest to lads. There was always a large display of Dinky toys and Matchbox series toys. Stan had a number of cars for hire for weddings and funerals and there were two petrol pumps situated in the large recessed door to the garage, these pumps were worked manually. I sold football papers on a Saturday night for Stan and one night when checking the money it was 2 shillings and 4 pence up (about 12 pence) on the number of papers I had sold. Someone had given me a half crown coin and a one pence coin instead of two penny coins (tuppence). I thought I was a millionaire. As kids we would peer through the window of the workshop of Mr Alderson the Undertaker whose workshop was situated in Whitehouse Lane just above the Flass. Mr Alderson made the coffins that his business required and he and his family lived in the end house of Durham Road opposite the Methodist Chapel. The Police Station was situated in Durham Road, about No 5. The Sergeant and his officers turned out at 10pm and when we were told to leave the Crook Store doorway and make our way home we went without any back chat or grumbles. The Police were respected and you would get a clip if you back chatted them. I cannot remember any vandalism, theft or burglaries in Ushaw Moor although there may have been. People respected other peoples property and you were taught at a young age that it was wrong to steal. When the Police Station closed Sid Brown the Baker moved into the premises from his shop at the bottom of Station Road. I was reading on Face Book earlier about Joe Lowerys ice cream shop. Joes main job was a milkman. He had a milk round in Ushaw Moor, his cart was drawn by his horse, Peter. Peter was kept in a field next to St. Josephs school and he was a great favourite of the children there including myself. There was no ice cream made at the shop during the war years due to the shortage of milk. When they started making the ice cream again it was very creamy and was the best I have tasted. The shop was all mirrors and highly polished dark wooden furniture and was always dim and cool. I hope I haven’t rambled on to much and I hope someone gets some happy memories when they read my ramblings. I cannot understand why more people of my age do not contribute to this site. It is a credit to Paul Clough and all the hard work he puts into it. My family moved to ollerton in september of 1957,from ushaw moor near durham.the move had been delayed by the birth 5 weeks earlier of my sister patricia,she arrived on my birthday,so the children of the family had had to stay with grandma and grandad till dad had the house done so we could “just move in”we all piled out of the car and the moving van began to empty.and suddenly there was a comotion in the house,in his haste to get the place ready my father and his pals had painted and papered most rooms but the lounge was upside down the flowers were supposd to go the other way said my mother,,,,the grandparents pointed out to her that it could be changed at another day,,,so we moved lock stock and six children into 86 petersmiths drive,one of the four bedroom houses on what the locals called the geordie reservation.the roads were that pale brown stuff they put down before its tarmacked. and the street lights had only just been given lightbulbs. we all joined schools.my eldest sister was sent to walesby lane and the rest of us to forest view.but as mum pointed out since my sister herded us most places she couldnt do that if she was to be on time for her to attend walsby lane,so she was sent to Forest veiw with us and resumed herding duties.we were sent to reconoiter the streets around us and quickly dicovered allmost all the neighbours we had at ushaw moor and braancepeth were dissperesed in the surrounding streets..wahay..so i hadnt far to go to find the kids ide gone to school with “up north” the locals had no manners.. they would make fun of the way we spoke and said “ayup” instead of hello.they had the impression we kept coal in the bath..there was an influx of scotts after us and then polish familys .the estate was huge,the shops on whitewater road leading up to the church circle and the main street.at the other end was one little shop,across from the football field ,,cricket pitch,and then allong walesby lane to forest view school and the dairy then the police station.i lived in ollerton for 27 years till i moved to worksop in 1988.my dad called it ollerton by the sea because we could go down to the river maun with my dad on sundays to get us all out of mums way till dinner was ready.